Whether you’re remodeling a bedroom to suit your requirements or make it more appealing for homebuyers, a bedroom with a new look is not only aesthetically appealing, but it can also provide you with an ROI between 30-80%. So, whether you want to paint your bedroom in brighter shades or completely remodel it, with a little planning, remodeling a bedroom can be done efficiently and safely. Here’s how. What Do You Have in Mind? Do you simply want to change your bedroom’s color? Are you looking to rearrange the décor and furnishings or completely replace them? Are you looking for more space and better organization? Know exactly what you want out of the project so you’ll have a clear idea of the timeline, difficulty, and budget for the remodel. What’s Your Style? What kind of bedroom do you want? Airy and bright? Cozy and dim? Clam and zen or packed with technology? Pick a style at the beginning to avoid confusions and conflicts during remodeling. Do You Have Any Limitations? Do you have cats or dogs that sleep in the room every night? Is it a room for a toddler or a teenager? Are you parents to a newborn? Need to accommodate elderly relatives? Knowing who will be spending time in the room will help you determine what you can and can’t do with the remodel. How Do You Plan to Use It? Do you just plan to sleep in the bedroom or turn it into a movie theatre? Is it also your kids’ play area? Usage is a critical factor in deciding the type of furniture you’ll require, the style of furnishings, the colors of the walls, and more. You don’t have to tear down walls push up ceilings to add more space. You certainly could do those things, but that can be a long — and expensive — process. Add space to your bedroom by making better use of it. Utilize space under the bed. Find furniture with built-in storage. Reorganize your closet. Instead of adding single beds for your kids, go with bunk beds. Or, just add life to your existing furniture with a fresh coat of paint. By making sure every space in the room has something to do with storage and/or organization, you’ll be able to reclaim your space and make it more functional. While you’re adding space and organizing things, it’s time to channel your inner Marie Kondo and get rid of any items that you don’t want, use, or need. In her Netflix series, Tidying Up with Marie Kondo, Marie encourages you to ask one simple question — “Does this item spark joy?” If it doesn’t, get rid of it! Sure, you like to read a novel before going to bed, but do you really need a pile of books on your side table? Why hold onto unused or worn out clothes, accessories, and footwear? Declutter as much as possible. Trust us, it’s liberating. Painting a bedroom is probably the most inexpensive and easy way to remodel a bedroom. So, pick a color that enhances the look for your room and improves the ambiance — something warm, cozy, and soothing for the eyes. You have thousands of eclectic and bright shades to choose from. Painting your bedroom the wrong color could lead to a stressful situation. Literally. Studies have discovered that painting your bedroom a too stimulating shade, like red, increases stress. Try blues, greens, or purples instead. Regardless of what The Dude says, it isn’t the rug that ties the room together, it’s the window dressings! Since bedrooms are typically clustered with large furniture, the eye is naturally drawn toward the windows, and that’s where window dressings can really shine. Blinds, curtains, and shades can be a costly affair, so shop wisely. White panel curtains can be a great pick as they blend well with all bedroom wall shades and furniture. Whether it’s canvas prints, tapestries, or kids’ paintings, the bedroom is a great place display artwork that you love. If you prefer a plain, uncluttered look, strategically hang one or two pieces on a wall by themselves. Good lighting is the sign of a well-designed room. Does your bedroom have too much light? Consider installing dimmers to reduce overhead glares. Too dark? A few well-placed lamps can enhance visibility without straining the eyes or overloading the senses. 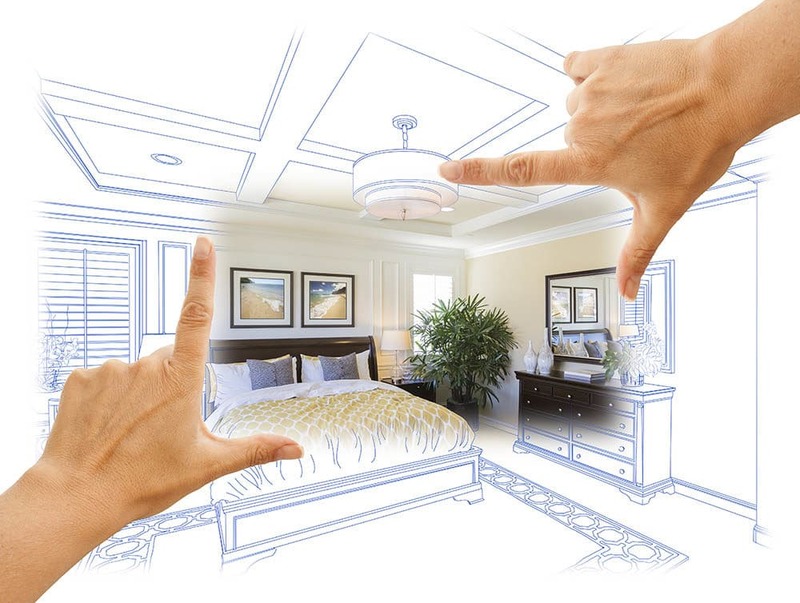 Want to learn more about remodeling a bedroom (and the rest of your home)? Check out our blog for great tips and tricks!